Yet another fashion brand joined the luxury mobile phones bandwagon today. Versace announced their Unique touch-driven phone, which was developed in cooperation with ModeLabs Group and LG. The face of the hand-crafted (did you really expect something else?) Versace Unique is constructed from ceramic or handmade lacquers, while the frame options include 18K yellow gold finish or 316L grade stainless steel inlay. The leather back is embossed with the all too familiar Medusa head logo. The Versace Unique sapphire crystal screen is the largest single piece of this high-tech material ever produced for consumers. Scratch-resistant and all, it should provide the ultimate protection for the Unique 3-inch touchscreen of yet unknown resolution. 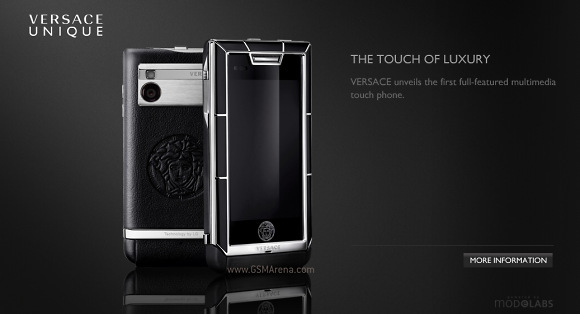 The other features of the Versace Unique, which geeks might find interesting are its 5 megapixel camera and 3G support. The (probably ridiculously overpriced) handset will start shipping next month. Oh, yeah! It will team up with my Moto AURA so nice. :D I love it!! !